As Hurricane Florence ascends on North Carolina, one weather reporter has become the laughing stock of the internet during a time when humor is welcomed. 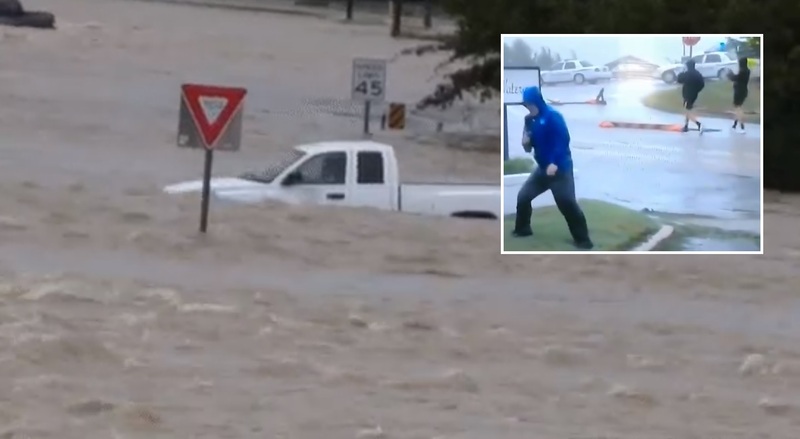 The local reporter has been getting slammed online for exaggerating how strong the winds were during a live TV report. He stood bracing himself in the winds with his legs far apart and appeared to be fighting just to stand up. Meanwhile, the foreground of the shot shows two people casually strolling behind the reporter as if unphased by the seemingly dangerous winds. The video has spread online like wildfire and the reporter has faced some scorn from some while others commended him for the much needed comedic relief. The hurricane has already claimed its first victims as it barreled into North Carolina near Wrightsville Beach. Already, hundreds of people have become trapped by flood waters as entire communities lay in wait for the storm to pass. Weather forecasters fear that this could be just the opening act. Another reporter was caught exaggerating the depth of flood waters from inside a canoe. Similarly to the response of the reporter who acted as if winds were so strong he could barely stand, reactions to the woman portraying herself in 6 feet of water have been comical as well. One Twitter user said, "Another one! She tries to portray water 6 feet deep until a brace of dudes stroll through with a 12 pack of PBR. Love it! #fakenews #fakeweather"
All jokes aside, the situation in the east coast is deadly and tragic. So far five people have been killed including a mother and an infant, according to Wilmington Police Department. "WPD can confirm the first two fatalities of Hurricane #Florence in Wilmington. A mother and infant were killed when a tree fell on their house. The father was transported to NHRMC with injuries," the tweet said. Winds of up to 70 mph are expected for the next several days as the weather system slowly grinds across the region. 1.7 million people have been issued evacuation warnings in the area as the life-threatening storm surge continues. Two of the victims were in their 70's and were killed in Lenoir County. One was killed will connecting an electrical generator while the other man was killed in a wind-related accident while checking on his dogs. Videos of flood waters show dolphins are even trying to escape the storm. U.S. officials are warning that the risks posed by the catastrophic flooding are still extremely dangerous with forecasters saying the storm surge could reach as high as 10 feet in places. Governor Cooper said Hurricane Florence was likely going to "continue its violent grind across the state for days". Forecasters also say the hurricane is now moving into eastern South Carolina at a mere 3 mph. The slow speeds of the storm mean it will be hanging over the east coast regions for an extended period of time and could dump as much as 18 trillion gallons of rainwater on U.S. soil, according to meteorologist Ryan Maue.